Of course not! NO slimy oysters in my dressing..just Trader Joes multi-grain bread that I leave out for two days, mirepoix of celery, carrots and onions; sage and spices, and lots of butter. And then--the terrifying quandary of THE GRAVY. Every year the same wail of apprehension goes out from my brain: HOW do you make gravy??? I, too, LOVE LOVE LOVE Thanksgiving...for family, friends, and for the food. Our Thanksgiving meal is shared with a bunch of omnivores, three vegetarians, one person who's lactose-intolerant, and another who's wheat-intolerant. So I use rice flour for the gravy and vegetable stock for the butternut squash soup, and there's lots of dishes so no one starves. 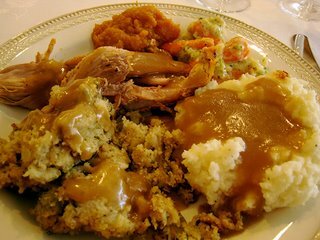 And honestly, as gourmet a cook as I, am I wouldn't have anything but packaged seasoned stuffing (Pepperidge Farm does very nicely, thank you very much) leavened with chopped onion and celery and, of course, smothered in homemade gravy. The problem with a stuffed bird is that you don't get the pan drippings that you'd get with an unstuffed bird. So the gravy is more of a challenge. Anyone have a way around this gotcha, short of wringing out the stuffing?? I'm with you on the Pepperidge Farm cubes. And with Roberta on the chocolate cream pie. I don't have to have Thanksgiving in the same place, but when I cook, I HAVE to have the same selection of pies (apple, pumpkin, chocolate cream.) and Kielbasa as an appetizer because my mother was Polish. I like flour instead of cornstarch in the gravy (makes a less shiny gravy) and dried cranberries in the stuffing. I think it tastes better cooked in the bird and as long as you wait until right before it goes in to stuff it, you don't have to worry about Salmonella ------I hope! 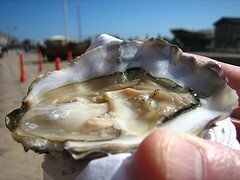 What is with oysters? Squishy things, ick. I cooked my first turkey my senior year in high school, because I wanted the whole family to go to our Thanksgiving Day football game. Now I can do it in my sleep. The secret is...that tacky Pepperidge Farm stuffing in a bag. Thanksgiving just doesn't taste right without it--I think it's the MSG. Hank, my grandmother could not cook. I mean, she never learned, at all. She could make meatloaf and fudge--and gravy. She was always the designated gravy maker, and it was always great. Turkey grease, flour, stock--presto! I keep promising myself that one of these years I'm going to head to Plimoth Plantation (a mere twenty minutes away) and let them do the whole thing! Oh, Ro! I can't tell you how many times I've hauled out Martha Stewart's Entertaining. (I can practically recite the Christmas book--I have a first edition and a softcover version.) I have a few of the millions of other books she's been associated with (we all know she doesn't write them, right? ), but the first few were the best. My mother is 82 and is "doing Thanksgiving" next week. Which means that I will be "doing" a lot of it "with" her. And I thought we were the only ones in the US who ate brussels sprouts. Well, I like shiny gravy. And Pepperidge farm cubes are great, love the seasoning, but TJ bread has fewer sugars. Also--Whole Foods has a wonderful seasoning herbs and spices mix, it's fresh and comes in a little plastic container. And for the juices problem...you have that whole pan when you take the turkey out. So I put it right on the stove, turn up the heat, and add water and white wine. Stir it so all those nice black and brown bits some off the botom and edges, and simmer for awhile. Then add the cornstarch (sorry Jan)that's already been mixed into a paste in cold water. Very important! So, no lumps. Salt and pepper. And now, I'm so hungry! Lorraine, Hallie has the best Brussels sprouts recipe! I don't really like them--but I love hers! I'm getting hungry reading these comments! I roast my turkey with chicken broth in the pan, sometimes mixed with some water depending on how long it roasts and how much I have to add. I use that to make the gravy (flour for me). When I was little my grandmother always made the turkey and brought it to our house, and *every, single year* she would say "God sends the food, the devil sends the cook." Didn't go over well with my mother who had made most of the meal! Oh, Peg, I love hearing about those family sayings! And we'd all howl with laughter. I think there must be a secret society of women who love brussels sprouts! I just had lunch with a woman and the two of us confessed our love for them and split a dish for lunch. Lorraine, I've gone through 3 copies of Entertaining getting my last one a year ago when MS did an ann'y show. I was in the audience watching my husband and his friends reminisce about the good old days. Check out the recipe for chocolate pecan tartlets. And the applesauce spice cake. They're orgasmic. My favorite family Thanksgiving story was from my mom's side. I don't know whose idea it was, but back in the 1930s they cooked the turkey overnight at about 175 degrees...Everyone spent Thanksgiving night throwing up, etc. It's only my favorite story because no one died! We do our own little Thanksgivings now. Much less stress. This year we're even taking the kids to a fun, secret location! Peanut Soup - a recipe from Williamsburg. Man, you don't even want to know the calories(Just Don't Ask), but its rich overwhelming wonderfulness is a solid presence for us vegetarians sidestepping the turkey. Oh, I do love to make (and eat!) peanut soup. Hmm, peanut soup...does not sound like it would float my boat. Maybe if you listed the fattening ingredients:). This year she's volunteered to make stuffed butternut squash. Should be interesting. Oh, I love stuffed butternut squash. Thanksgiving food is such an opportunity for texture and flavor combinations. And having just got out of the hospital, where 'vegetarian bland' was labeled on the top of every meal, boy am I grateful to be home again in the festive season! Roasted tomatoes with parmesan, sweet corn with lime sour cream sauce, cranberry Wensleydale cheese on octagonal wheat crackers, cream of peanut soup with chipotle. Color! Texture! Taste! I just had a pumpkin polenta that was out of this world. Happy, blessed Thanksgiving to you all. Roberta, any chance of your posting the recipe for the maple pumpkin pie? 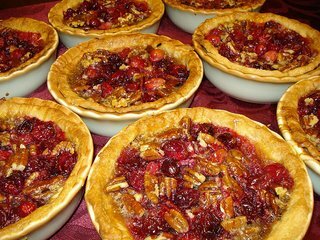 I doubt I'll be allowed to make it this T'giving, but I love baking and it sounds delicious! Hank--your mom, my mom--sisters under the skin. Not oysters, no, but if they'd been there, she'd have done that! And I'd have gotten the same eye roll years later. I'm rebelling against the green beans I usually do, and this year I'm making an orange, dried cranberry, toasted almond thingy I created. Since I rarely "create" food worth eating, I'm feeling pleased and proud.